Tectoctar was a small city of 6,000 people who the rest of the world described as degenerates. Tectoctar was one of the most awful places one could imagine to live in. It had food and shelter, but not of a particularly good kind. The place had its share of problems with all the bugs, the seasonal flooding, and the continual sinking of any building into Danar’s Swamp. It’s rumored that some of the oldest buildings have basements so far done that they go into the Underdark. 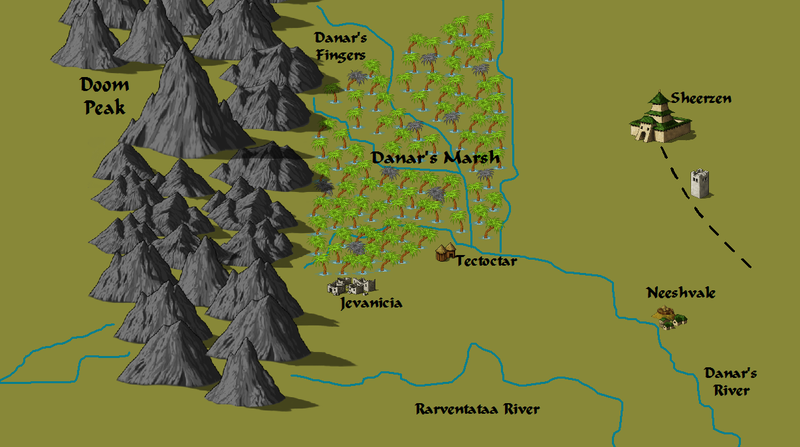 Tectoctar was built on Danar’s Swamp, not next to it, under it, or over it, but on it. The town was built by Tectoctar, a Xorian general turned renegade, who led his army to the north and settled in the swamp when he received a sign from Zeus. Zeus had intended the usurper to die in the swamp, but Tectoctar was an excellent commander and managed to force his troops to stay and work through the absolute discipline he had instilled in them prior to their expedition. Additionally he had his lieutenant general cast a spell that let him read people’s thoughts allowing him to punish traitors before they committed their first act of sedition. Unfortunately for Tectoctar the side effect of knowing every man’s thoughts within a two mile radius is rather destructive. The tyrant general went insane and disappeared into the western reaches of the bog. The citizens of the city had already settled down and knowing they would not be welcomed back in Xoria decided to stay. Tectoctar had no city plan of any kind. Occasionally an architectural accident would make a front door unreachable and required a new one to be cut in the walls. The principal building material was wood sent upriver from Bigby’s forest. The wood was used to create a frame for the house and then covered with hides, leaves, or hay to keep the rain and bugs out. Any building made with a heavier structure sank into the ground within a few months and even the wooden structures were constantly sinking, creating basements of ever increasing size beneath the city. The extremely moist soil of Tectoctar was quite good for growing rice, but excruciatingly bad for anything else most people consider edible. A type of flower grows in the swamp that can be eaten called Shorehorn. The animal life that served as the protein for most Tectoctarian dishes is revolting. Snails, slugs, leeches, unclean fish, snakes, and other reptiles. The lucky outsider was served Tojanida. These monsters dwell in the swamp and when a dead one is found it was often sold to the wealthy of the town. As Tectoctar grew older more people immigrated who were rejected by other cities and countries and were told of a paradise where everyone is welcome. Many of them were not impressed by the “paradise.” Some vagabonds left if they could, but most had run out of money getting to the city and were forced to stay. The rare few actually liked Tectoctar better because at least they are the same as everyone else here. The descendants of these immigrants composed the majority of the city’s population. Tectoctar neither exported nor imported anything because it is nothing more than a large poor town in the middle of a swamp. The one attraction to the town was their local artifact of chewing gum, a type of food that oozes from trees that you cannot actually stop getting sustenance from. You could chew gum forever and never have to worry about eating, drinking, or going to the bathroom again. Unfortunately this miraculous item does not keep for more than a day, so it was only traded in mass quantities to the most foolish of tourists. The city was ruled by the Race Council. An influential member of each race that lived in Tectoctar was appointed by their brethren to the council. The council had representatives from many different species including, Humans, Elves, Dwarves, Halflings, Dragons, Ogres, Giants, Goblins, Orcs, Lizardfolk, Gnolls, Trolls, Kobolds, and Troglodytes. Each off shoot of one race was still considered the same. A rather extreme example of the inequity of this policy was present in the representation of Drow by a High Elf councilor. The Race council met once every three months to decide on issues that affected the entire city. The Xorian government long resented the existence of Tectoctar as it was technically a rebel city. During the regency of Queen Anajakaze, the Xorian army attacked and defeated Tectoctar. It’s people were executed, enslaved, or driven out of the city. With no one else to inhabit the buildings, the city slowly sank into the swamp. The structures still exist beneath the muck, slowly rotting away, but also perhaps holding magic treasures for explorers brave and clever enough to find them. 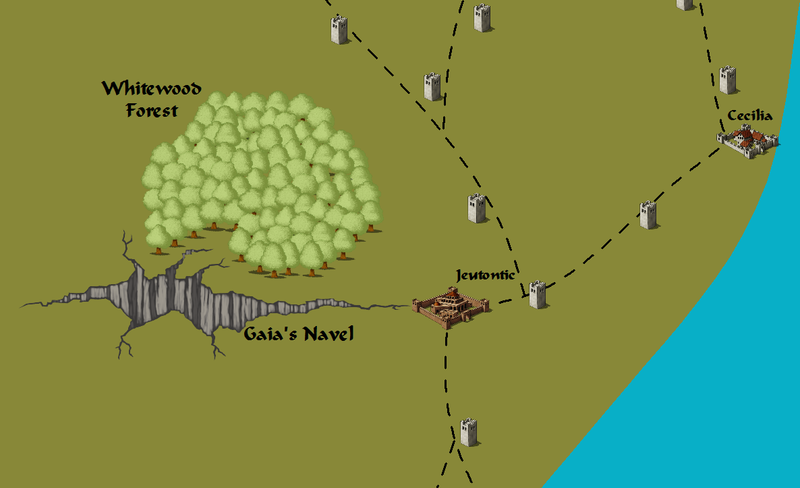 After the destruction of Tectoctar, Queen Anajakaze created a new colony on the edge of Danar’s Swamp named Jevanicia. 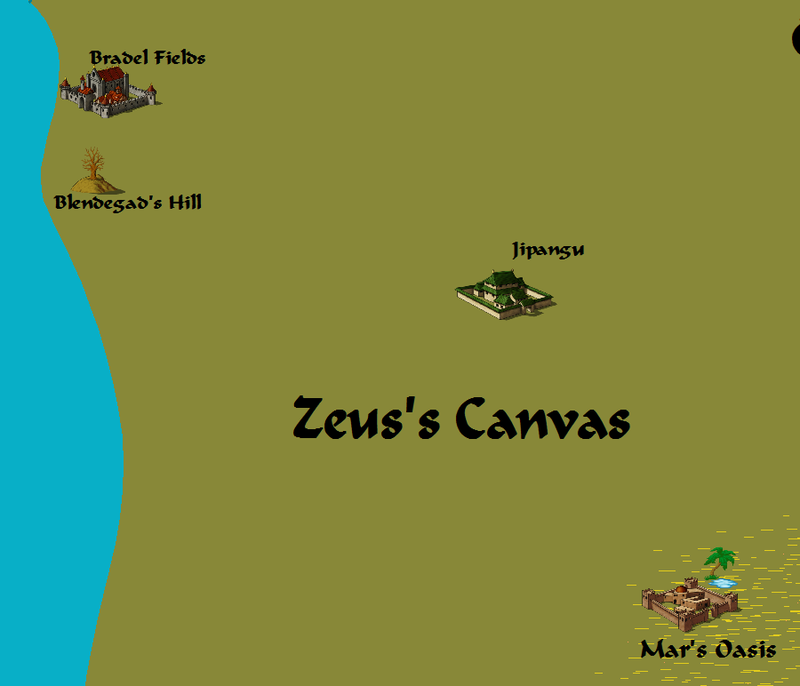 Jipangu is a large city of 110,000 people in the middle of Zeus’s Canvas. Most of the people in the city have some relation to one noble family or another even if they are several hundred steps away from being leader of their family. All this nobility confuses outsiders, but for those who grow up with it, the whole hierarchy makes perfect sense. In fact, the natives find societies without this level of nobility difficult to understand. Jipangu is built on Zeus’s Canvas, a place in which great storms rage year round. The city is atop a large, dirt-covered, rock plateau. The constant deluges do not have disastrous effects for the citizens when they are inside the city. Irrigation canals reroute the large amount of rain from the plateau into the rice patty fields that feed the large population of Jipangu. An ancient orchard also exists close to the city. It has many different types of fruit that are eaten by the Jipanguese and the birds that flock around it. Sounders of pigs are kept around the city for the disposal of waste and to provide fresh meat for the citizens. Honor is very important to the Jipanguese. The slightest offense or indignity is settled with a duel or immediate compensation; thus, there are many duel shrines in every section of the city. These places look like large square gazebos with benches on the outside for spectators to watch the duels if they wish. Within the shrine a weapons bracket holds a variety of wooden weapons. Most duels are decided by the first hit landed with a wooden weapon. Serious offenses will proceed until one combatant is rendered unconscious. Only in extremely dire circumstances are duels to the death. Duels to the death are scheduled in advance to allow both sides to make arrangements should they die. Such duels attract large crowds. Because of all these duels the average citizen in Jipangu can act to carry out his own justice. The high sense of honor prevents most of the citizenry from abusing their skills. Jipangu has neither police force nor the need for it because of all the trained swordsmen. Secret crimes, like burglary, are still committed in Jipangu. Such crimes are investigated by the government detective agency, Tarot De’Longshare. The army handles riots and revolts when they do occur. The system works well and crime in the city is swiftly punished. Jipangu has a militaristic culture. A strong man is respected and gains honor with every fight he wins. Weak men lose their political power without repeated reinforcement from their other traits. The high value on physical strength makes surrender an unacceptable and cowardly option. The Jipanguese army does not retreat from battle. Politicians do not change their positions when the situation changes. This adamancy in one’s decisions once they are made means very few things are said with uncertainty in Jipangu. An unofficial law has sprung up that if one breaks their word, they will be exiled. Jipangu has a traditional style of clothes that is worn at all times by people in the city-state. Anyone not doing so is socially ridiculed and outcast. The traditional garb is a long, colored vest worn over a white shirt. The color of the vest indicates the wearer’s honor and position in the hierarchy of Jipangu. A headband is also worn that signifies special achievements by the symbols upon it. The pants of the outfit are extremely baggy below the knee, but no other special significance is applied to them. Silk is of course better than cotton or wool. Pants are worn by both sexes except at special ceremonies. There are no special shoes worn with the outfit. Armor is not worn within the city except by soldiers. The official Jipanguese army of 7,000 is one of the best equipped and trained in Cimmeria, but it lacks unity. The soldiers fight for themselves and their own honor. Tactics are often simply choosing where the troops will charge from. The army does contain infantry, cavalry, archery, clerical, and magical units. Each unit has its general and each general has his centurions. They meet before each battle to discuss where they will fight, but since honor is obtained through killing with your own sword, instead of the overall victory, they will work on their on. Jipangu has a First Family that rules over the whole city and decides disputes between the other families. The most honorable family holds this position and only loses it in a challenge by another family or through a major dishonorable event for the First Family. In the case of a dishonored First Family a council of all the families is called to decide which of them will take the place of the First Family in the new order. The art of the city is some of the best in the world and it is present throughout the whole city. Almost every object, piece of furniture, and wall is decorated in some way. Vines, flowers, and all things natural and beautiful are usually the subject of art. If Jipanguese art was a representation of the real world then there would be no people, actions, or conflict in it. These things are always absent from the walls, paintings, and sculptures of Jipangu. Their focus is on still-life pictures. Jipangu joined the Second Alliance against Xoria. Arendil, the current head of the First Family, leads the Alliance as well. Jipangu is currently hosting thousands of refugees that escaped from Phoenix when the city was conquered by the Xorians. The influx of people puts a strain on Jipangu’s resources, but imports from the rest of the Alliance have alleviated some of that burden. The refugees of Phoenix along with many people from Dalleer, Dorrowsan, and Shalerton have all gathered outside of Jipangu for military training. Gradorian and Junai, the previous leaders of the Mercenaries Guild of Phoenix, are in charge of this vast training program. Kig Yupington assists the two generals as he can with the Dorrowsan Scepter. The training is further accelerated by rituals read from the Tome of Agamemnon. These rituals purify water teleported to the city from the Geyser of Talos. Any who drink this water are transformed into a terrifying warrior for a day. This transformation allows the trainees at Jipangu to learn techniques and strategies that would normally be beyond their abilities. Copper with his technicolor rope (it looks brown to him). I got a new dog three weeks ago named Copper. 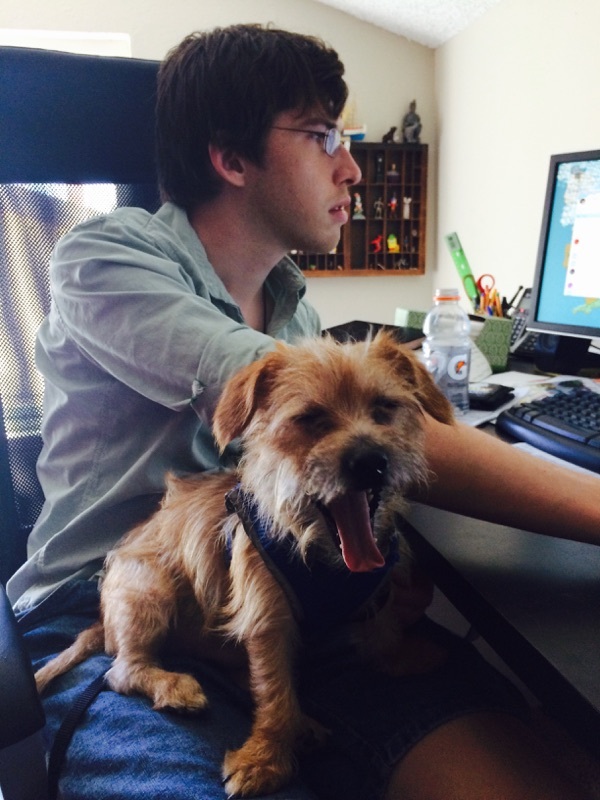 He’s a Jack Russel/Yorkshire Terrier mix as you can see. Before we adopted him he was found on the street when he was about one year old. His first shelter gave him all his shots, but he was apparently too shy for adoption. They were going to put him down. A different shelter adopted him to prevent his death. They neutered him and about a month after that we got him. He’s been quite a hand full. The shelter my wife and I adopted him from assured us that he was house trained, leash trained, and got along with cats. I can assure you that none of those things were true when we got him. He’s pooped in pretty much every room in the house. We’ve been working solidly on house training him, but its still frustrating. He’s somewhat leash trained, but he doesn’t like going on walks for some reason. Copper doesn’t run when I tell him I’m taking him on a walk, but he doesn’t get very excited either. Once the walk starts he spends the first two blocks trying to go back home until he realizes that I won’t let him do that. Then he starts enjoying his time outside. And the cat thing. He actually does get along with the cats now that he knows them, but at first it was just a bunch of fights between them. Their relationship still isn’t perfect, but at least they aren’t trying to murder each other 24/7 anymore. He certainly isn’t shy around us, but he’s proven to be very territorial and aggressive towards other people. 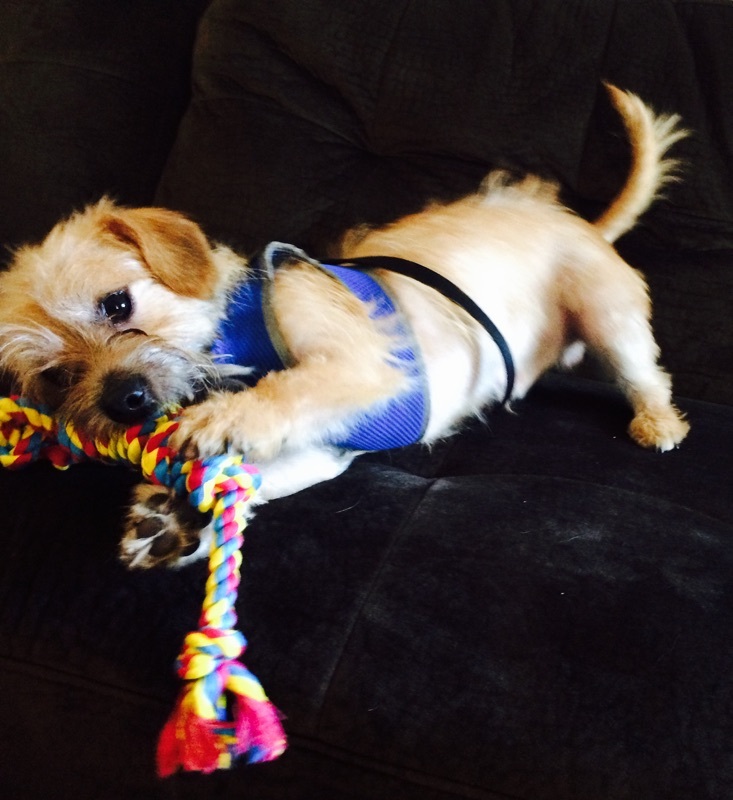 The best way to fix that is to take him to a dog park and socialize him with other dogs. I’d like to do the dog park thing, but unfortunately, Copper doesn’t know any basic commands yet. If he went wild for some reason at the park there’d be no way to control him besides force. I’ve been teaching him basic commands (sit, down, stay, come, off, drop) and he’s made some improvements. Hopefully he’ll master those within the next few weeks and then we can take him to the dog park. He’s shown promise for learning a few other commands as well. He loves to jump up and down on his hind legs. He can close drawers by jumping up and pushing on them. He knows how to do rolls and how to fetch. He just isn’t trained to do any of those things on command yet. The fortunate thing is that if he does tricks like those on his own, then he can be trained to do them on command fairly easily. I’ll work on that after he reliably does the basic commands. Sitting on my lap while I write the blog. Copper is a great dog. I’d wanted a dog for a long time and I’d built up this ideal dog in my head that I would get when the time is right. Copper is not that dog, but he’s showing that he can be if we help him to learn how. 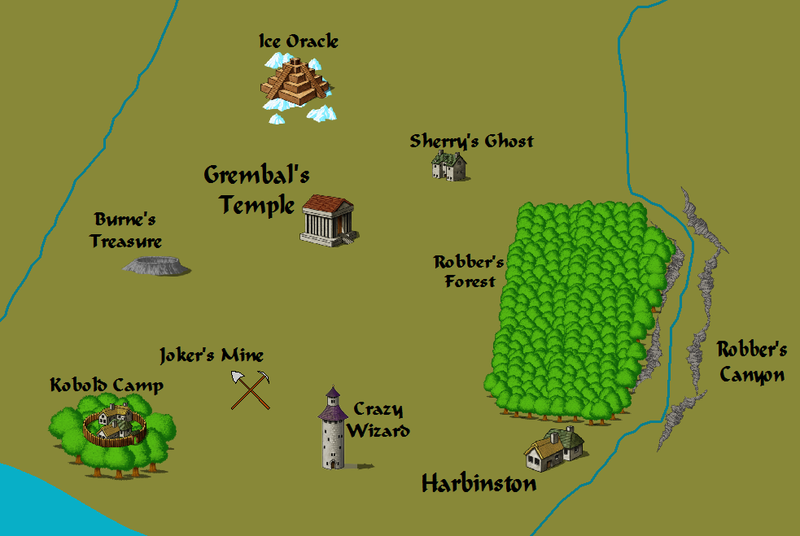 Harbinston isn’t nearly as politically important to Cimmeria as the other cities I’ve detailed. It is a small village on the border of the territories influenced by Bradel Fields and Dalleer. I wrote a description of the out of the way town because a series of adventures I ran for my players was based in the village. Maybe the village will be important in my current campaign and maybe it won’t. Time will tell! Harbinston is a small town of little more than four hundred people. The town sprung up as a trading stop between Dalleer and Bradel Fields. Merchants and traders traveling on the Black River would stop at the easy banking spot close to Robber’s Canyon. As trade increased along the river it also increased the number of robbers from which Robber’s Canyon gets its name. Many of the townsfolks had two lives, one of theft, and another of reprovisioning their victims. No concrete evidence of the duplicity was ever discovered, but the traveling merchants eventually grew suspicious and switched their method of travel to caravans along the eastern shore, safe from the robbers’ ambush tactic. Harbinston’s large bandit population was a result of no administrative control in the town. No system of government controlled the town and for a long time both Dalleer and Bradel Fields claimed the small town as their own. The dual claim caused a standoff where neither city sent representatives to the town as doing so might spark a war between the two larger city-states. About sixty years ago a group of adventurers did take an interest in cleaning up the town and cleaning out the nearby dungeons. The adventurers provided a steady flow of income to the villagers from the dungeons they raided. Highwaymen moved back to town and reopened their old shops to draw the heroes’ attention, greatly reducing bandit activity. The peace did not last forever. Eventually the adventurers retired to various mansions they had built close to the town and the highwaymen came back to prey on what little river traffic remained. One of the adventurers, Burne, even led the bandits for a time. When the adventurers retired Harbinston lost its temporary protection against the many different monsters and creatures that have chosen to live around it. The town had no real guardians to act as predators for the monsters of the world, so every beast imaginable invaded the area surrounding the little village. Constructs, undead, plant monsters, mutated beasts, trolls, minotaurs, and even a dragon with its kobold servants moved to the fertile and previously unsettled fields around Harbinston. The dragon, called Joker, took a maiden from the town every decade. To make matters worse two decades ago Harbinston had an outbreak of the plague. Without an experienced enough cleric to cast remove disease, the town sought help from Dalleer. 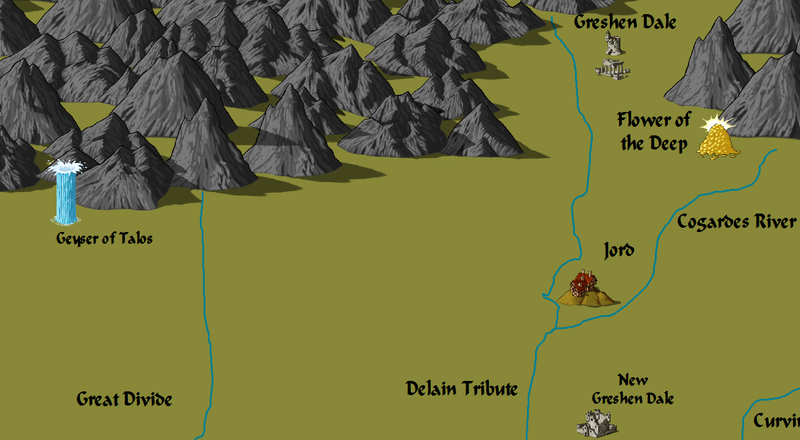 Surprisingly, Dalleer agreed to send some strong clerics and medical supplies downriver and for once it looked like the town would have a lord to protect it. Unfortunately, due to a misunderstanding, the town’s bandits attacked the medical barges. The medicine was not lost because of the strong guards Dalleer had hired, so the sick people in Harbinston were saved. The same could not be said for the dozens of young men who lost their lives in the foolish battle. Diplomacy with Dalleer was broken off after the incident. The same guards who killed so many of Harbinston’s men to defend the medicine took it upon themselves to remove the other afflictions that plagued the town. They slew Joker and freed the maidens he had taken as his captive wives. 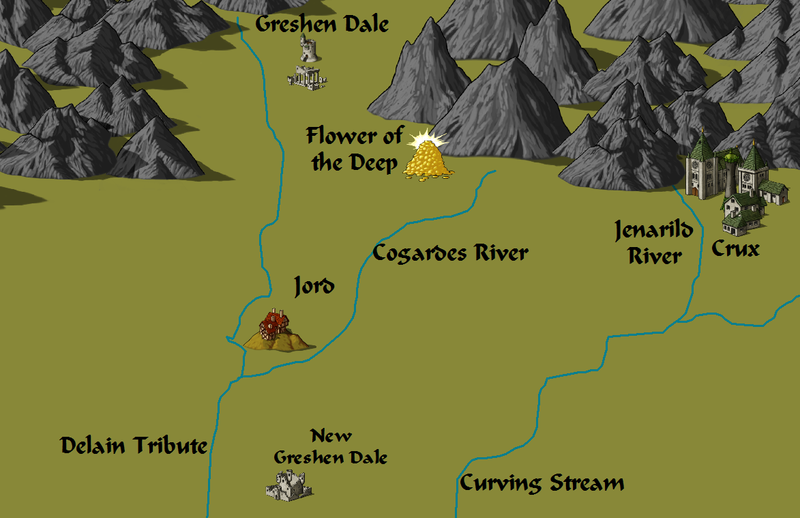 The guards cut a bloody swath around the town, removing every monstrous threat for miles, save the kobold servants of Joker who were left to their own devices. The town began to thrive again after the monsters were slain. With the bandits gone as well, trade resumed. Only the occasional kobold attack interrupted the town’s resurgence. During the recent negotiations between Bradel Fields and Dalleer, Bradel Fields agreed to cede all claims to Harbinston in exchange for Dalleer’s entrance into the Second Alliance War against Xoria. Harbinston now has official protection from a large city-state as well and it seems could never be brighter for this small settlement in the wilderness. Most of the original band of heroes that protected the town are now long dead. The remaining hero, Sherlock the Warlock, built a tall tower for himself a day’s journey outside of town. He hasn’t left the tower in decades. Adventurers visit him occasionally and tell tales of all manner of strange things in the tower. Sherlock appears very knowledgeable if knowledge is what you seek. The adventurers who have gone to the tower also say that the old wizard has lost his mind. My wife and I saw Minions this weekend and we were both a little disappointed. We both liked the first two movies, but the series is suffering from sequelitis where each new movie is a little worse than the one before. Part of that problem is honestly a stronger focus on the minions with each new movie. They’re good as sidekick characters, but a mute slapstick comedic lead hasn’t worked since Buster Keaton. People just expect more out of their movies now. The plot of the movie is summed up pretty well in the trailers if you’ve seen those. Three minions try to find a villain to serve. They find Scarlet Overkill who tells them to steal the Queen of England’s crown. Hijinks ensue and Scarlet Overkill ends up wanting to kill the minions. The trailer used most of the funnier bits of the movie in it, so there weren’t many surprises left to see. The best part that was left out of the trailers was the Nelson family, a group of bankrobber fans of Scarlet Overkill. They’re just a happy loving family that also happens to rob banks and idolize super villains. Back to the general point, why didn’t the movie work for me? Because none of the characters were interesting (besides the Nelsons). The minions are cute and funny, but they don’t speak. They literally cannot deliver punchlines to jokes. There are basically only two other characters in the movie besides the minions, Scarlet Overkill and her dopey husband, Herb. Scarlet is the embodiment of rage. She rages really well and Sandra Bullock was a great cast to play that character, but is she funny? NOPE! I don’t go to the movies to see people get mad over petty things. I don’t got anywhere for that sort of thing. And Herb… He’s newspaper comic level funny. I can literally read the jokes he does every single day in the comics section. It’s just weak stuff. My wife and I are fans of the series, so we’d be the most likely group of people to enjoy this movie, but we just didn’t. I wouldn’t recommend it to other adults who liked the first two Despicable Me movies. Maybe for kids, but not adults. Another thing my wife and I had heard the movie was sexist before going to it. Gotta say, that was entirely wrong. 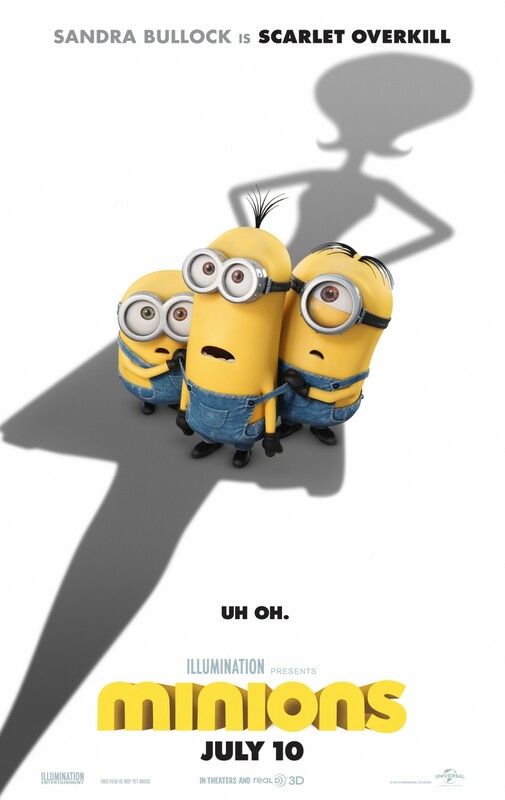 Minions has the same problem every other movie has with a lack of female characters. There’s Scarlet and the Queen. That’s it. The Queen is barely present, so most of the sexist accusations would have to revolve around Scarlet’s portrayal or just the general absence of female characters. Since nearly every movie is missing female characters I assume what we’d heard was directed towards how Scarlet was portrayed. And it just wasn’t sexist. She’s a powerful woman with a husband who is the “power behind the throne.” Basic role reversal already. At one point she’s getting put into a corset-type dress which one could claim is sexist, until the dress turns into a giant rocket 2 minutes later in the movie. You could also claim her desire to be pretty was imposing society’s values of what women should be, but that just feels like a stretch. The final issue might be Scarlet’s life long dream to be Queen of England. You could see that as her wanting to be a princess or you could see it as her wanting to be the ruler of a country. The sexism just wasn’t there (besides the no female characters thing). Anyways, most of the people who read this blog are adults, so I recommend that you don’t see this movie. Even if you are a fan of Despicable Me. Just watch the trailer again. It’s pretty much the same and will save you a lot of time and money.